When we moved into our house, the inside of the oven had not been cleaned for who knows how long. The oven glass had years worth of burnt food caked on in a sticky nasty mess. Here is what my oven glass and the inside of the oven door looked like when we moved in. You couldn't even see inside the window to check on the food. The best thing about this is that I didn't use any harsh chemicals, it was super easy, and I already had all the supplies on hand. Add a 1/4 cup of baking soda in a dish and mix just enough water to make a thick paste. Spread your mixture all over your glass (and the inside door if it needs it). Wait 15-20 minutes then wipe off. If you enjoyed this post, share it on pinterest! How To Make Your Pans SHINE! So I'm thinking that I'm going to go do this right now. Thanks for sharing. What a great tip! I've never heard this. Thanks for sharing it with us. I am seriously doing this right now! I have been putting off cleaning the oven because I don't want the awful fumes near the little ones. Will it work for the whole oven? I will try anyway. My oven glass looks like your "before" picture right now. I think I know what I'll be doing tomorrow! Did you scrub it on, let sit, scrub off with warm or hot water? It always works for me, my mom, and before that my Grandmom. It does work. Maybe your Grandmother was she-woman...I also had no luck, even used boiling water and tried over the course of 3 hours with the soaking. My homemade enzyme cleaner and a Brillo pad worked much better. Didn't work great for me after two tries. Does vinegar instead of water help? I didn't scrub; just sort of patted it on but I tried scrubbing off. What about leaving overnight? Wow, that is amazing! I need to clean my oven tommorow, I think I'll clean the window, too. I am doing this right now.....I will let you know how it goes. Great! I need this. Thanks for the tip. Great tip Jamie!! I'm so glad you stopped by my blog and left comments about my tablescape and tables because oh my goodness, I'm loving getting to come and visit your blog!!! I'm your newest follower!!! And so glad to be your bloggy friend!! I LOVE baking soda. My door doesn't look that bad, but it also doesn't look that good. :) I probably should try this. :) Thanks so much! I have to try that...PURE genius! Okay so I got right up from my desk and tried it. Now I just have to wait 20-30 minutes and see what happens. Neat and clean work makes your blog land very attractive and fabulous as well as in short, Cleaning each vessels are very lazy work for me. For me your blog is very inspiration. Wow! worked like a charm! isn't soda an amazing substance?? I never thought anyone could actually make me want to clean my oven...but I am now going to try this tommorrow. Thanks!! I love how simple things are what usually work best. I bet the EasyOff Oven cleaner people don't want this to get out. Does it work on the sides of the oven as well? I usually avoid cleaning the oven at all cost because I hate all the chemical in oven cleaners. Now I can hardly wait to clean the oven. Thanks for the great tip. Great tip, will be trying this since nothing else is getting in totally clean. Oh my goodness! I LOVE this tip! Thank you so much for sharing!! I found you over at Kindra's Terrific Under Ten. Excellent!!! Thanks for sharing, my oven window needs a good cleaning. Love it! I just cleaned mine and I can't wait to try this way! I had a hard time getting mine clean! Thank you! This is wonderful! Any way not to spray horrible toxins into the stove I am all for! Thanks for this! Going to try asap. Thanks so much for sharing this on Motivated Monday at BeColorful. Just letting you know I featured your post tonight. Thank you so much for sharing!! I came over from Dittle Dattle. I am going to do this! Do you think it would work inside the oven on spots too? I did the self clean today and there are still some black places. I wonder if this would work. I can't wait to give it a try! really?? really!! *shocked*.. I'll have to try that one..
are you for real? i am so doing this tonight!! Thanks so much. My oven window was making me CRAZY! This did not work for my oven very wel but the brilloe pas did :) At least I got it cleaned. I have my oven/window covered in this right now!!! Thanks for the tip! Can't wait to wipe it off and see how clean it is! Can't wait to try this one! Thanks for posting. Thanks for the all natural cleaning tip!! I can't use the harsh chemical cleaners...I hope it works!! I'm seriously going to go do this right now... :) Thanks! So I did this on the overhead vent as well, and the paint started coming off?! I tried this today please be careful, after 4 hours of mess my husband has gone to get a tool to take the oven door apart and to order a new seal to go around the door. The baking soda goes into every little hole and slit there is on the door. It soaked into my seal which was mesh and it came apart when we had to remove it. The sad thing about it it didn't do anything to clean the door what came off came off when I scrubbed it with a brillo pad and a toothbrush. My stove is only 2 years old. I love this! No need to use smelly, toxic chemicals!!!!! Wish I had seen this post last week, before I cleaned my oven!!!! Phooey, this didn't work for me. Thanks I will do this soon. this does sound very easy i am gonna try it! This looks super easy! A straight razor will work, too! I did this last night and it worked like a charm. Thanks for the easy an cheap cleaning solution. I just tried this and it did not work at all. I did it exactly like you said. Could I have done something wrong?.. maybe my mix wasn't liquidy enough, or i should of used a dry cloth to wipe it? I was really hoping this would work because my oven is gross. Tried this today, and it didn't work as well for me. I will try again though. I let it sit for 30 minutes or longer. Didn't work at all for me! What do u suggest? am going to try it today, thanks for the tip. Epic fail and an oven door that has to be completely taken apart. I did this twice and I think it may have gotten some of the grime off. Maybe. Then to my horror when I closed the oven door after attempt #2 a slurry of baking soda water came running down in BETWEEN THE PANES!! This must have happened when I was rinsing the soda off. PLEASE put a disclaimer at the top of your post. It seems like this is working very well of some, not so much for others. So now we have ugly lines between our panes!!! YUCK!! Me tooo! Now my door is ruined. It didn't work for me either, but at least it didn't ruin the door. I do have a lot of white grit that I am having trouble getting completely out of the oven. I have heated my oven to 200 degrees and put a cup of ammonia in an oven safe dish in the center of the oven. Turn off the oven and let the ammonia sit over night. 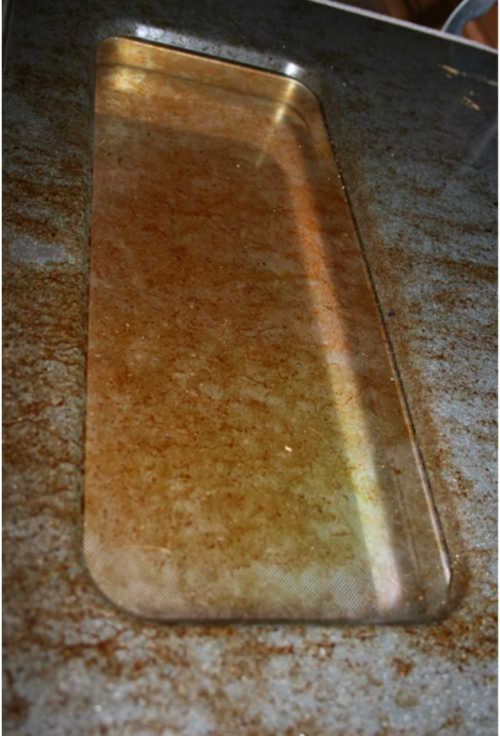 In the morning, use a wet sponge and wipe the glass door and entire oven. The burnt stuff comes right off! I wonder would this work on the top of oven as well? The ceramic type? This didn't work for me! Didn't work for me either. Even replaced the water with vinegar and tried again. That worked a little bit but still not enough. Time to use a brillo pad. Didn't work for me and my door wasn't anywhere near that dirty. After reading all the comments I was a little hesitant to try this. I wish others had said what type of oven they had. Mine is a Whirlpool Imperial series, self-cleaning, Accubake DUO system and purchased in 2000. This worked for me. Although I did note that if the solution was runny it didn't clean as well, and I had to follow up with an SOS pad. The worst spot I poured more baking soda directly onto it (straight from the box) until it was quite thick. it came off better than any other area. I made sure I kept the solution off the mesh seal and really wiped down the oven over and over again, as to make insure no baking soda residue. I also noticed that my glass was dirty from the inside. The baking soda has nothing to do with that. It was the manufacturing of the oven itself. I would this again. Much easier cleaning. Okay, I just tried this method. I have to say that the glass came clean but the door did not. Of course the glass is not perfectly clean and it did not get as clean as it did without some tough elbow grease. However I like the idea that my house did not smell and it was a lot quicker method. I have a self-cleaning oven...I will let it do the rest even though I will still have to smell something not so pleasant. I am happy about the glass though....BTW I used a dish rag that had mesh on one side and cloth on the other. I did not wet the rag as the baking soda was still moist. I used the mesh side to scrub and the cloth side to wipe. Then I rinsed the rag and continued to wipe of the solution. For those asking about inside the oven: My oven was absolutely heinous. Hadn't been cleaned in about 3 years, but lots of overflows and caked on stuff. I dusted dry baking soda about 1/2" thick, poured peroxide on it maybe 1/4" deep, making a runny sludge, and left it overnight. The only effort was getting the sludge out. No scrubbing at all. Thanks. I may try that on mine. Sounds like it would work great. Just read this...left the laptop and went and applied it...IT WORKS!!! so easy!! Thanks for posting! OMG!! this is amazing.. am gonna do this right now!! Thanks a ton! Worked like a charm! And I didn't get all woozy from fumes like when I used Easy Off. Thanks! This didn't work for me until I decided to dump vinegar onto the baking soda mix. Letting that sit there seemed to really help break down the grease and grime, though it was still more elbow grease than I expected. Nice idea; I'm glad it motivated me to finally clean the oven after somebody (not me) cooked a turkey in my oven without a roasting pan cover two years ago.... but it didn't exactly work as advertised. dont the baking soda and vinegar nutralize each other? how does that work? I have very mixed feelings on this. 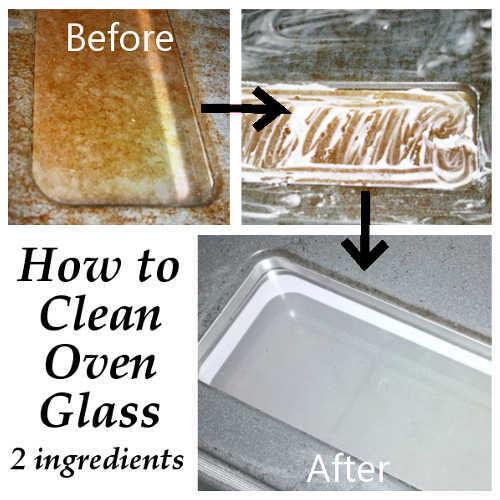 I have double ovens and tried this method to clean the glass and doors. For one oven door, it worked pretty easily. For the second door, (the door with more grunge on it thanks to roasting vegetables that had splattered olive oil all over), I thought I'd try it with some vinegar because I'd read some people elsewhere using that method and I thought it might help cut through the grease better. It didn't. I scrubbed a LOT and it barely made a dent. I cleaned that off and tried again with just the baking soda and water. It did work much easier, but it still took some scrubbing. I was really tickled that my oven door was clean, until the sunlight caught it and I realized that I had scratched the holy hell out of the glass. Baking soda is apparently too abrasive for oven door glass. I'm really disappointed to have damaged my exensive oven. :-( So yes, it cleans pretty well... if you don't mind scratching the glass pretty severely. So which would you prefer ? A clean oven door with scratches on the glass,[what was your manufacturers recommendation?] or continue to use and compound a greasy, sticky mess ? Who didn't clean the oven immediately after a known splatter from roasting vegetables ? Just saying.....Miracles don't always happen. I had a very similar situation. What really worked for me was a straight edge razor blade at an angle to really scrap it off as it was the cooked on stuff. The scouring pad will scratch your glass and some other cleansers. Bar Keeps Friends (?) i think is made to clean glass cooktops and is gentler. When trying another suggestion, the cleaner dripped down between the glass and door on my bottom oven and the glass will need to be removed in order to clean that. My little "project" has turned into a huge beast. Good luck! Are you kidding mmedow? Clearly she'd prefer an undamaged door! And she wouldn't be trying this method if she had cleaned the oven after the splatter. And I think she has a right to be a little upset that her door is now damaged. And it's good that she shared her experience. Hopefully other people won't try this and possibly ruin the door on their oven (like several people did!). Regardless of how environmental it is, this is NOT a good method for cleaning an oven door. And let's face it, if it you have to buy a new door after this, THAT'S NOT EXACTLY ENVIRONMENTAL. This method may have worked for the author, but I doubt it will work for many. I am trying this right now on my toaster oven. I am seriously thinking of buying a new one. But going to try this method first. I use this for my bath tub & shower I let it sit till the baking soda is dry then just wash it down. just don't get in the tub to do it as you could slip and fall! I have used this paste on my stainless steel appliances when there is an especially greasy or noticeable spot....just rub paste gently with the grain and immediately rinse with a clean damp rag.....NOTE : Baking Soda IS abrasive and CAN scratch some surfaces. That said....if you have hard to clean appliances in your home, or you are not vigilant about IMMEDIATELY cleaning messes [like me]....contact your manufacturer for advice if you do not want to go the DIY route ! There sometimes are no miracles in cleaning, other than ELBOW GREASE ! This did not work for me AT ALL. I left it on for 50 minutes. didn't even start to take stuff off. I wonder if the age of the baking soda matters???? probably... baking soda loses its effectiveness after opened. No, it wasn't your baking soda. It was just bad advice. Something that worked for me was covering the inside of the door with paper towels and then spraying them down with windex until wet, but not dripping (or straight ammonia). Then cover that with some plastic. Leave it for a few hours then come back and clean the glass with a razor blade. Wipe the rest of the door down with a soapy (but NOT sopping wet) sponge--you might need the scrubby side of your sponge for spots, but it should come up relatively easily. The ammonia totally breaks up the grease, but it's going to take longer than 20 minutes. Yet another self-cleaning tip on pinterest that seems not to work for the majority of people who try it. I tried the same solution for my oven racks--total fail (despite the like new after photos). Oven cleaner doesn't work on the oven glass, but ceramic cooktop cleaner will indeed make it look like new. Cerama Bryte is the best non-abrasive product out there. It isn't as cheap as baking soda, but it got off every speck of cooked on nastiness on my double ovens. Don't be afraid to use the scraper that comes with it--it can also work on the door too. Good luck and don't waste all of your baking soda trying people's "magic cleaning solutions". Sometimes, the store bought stuff is exactly what you need. Now glass cleaner...that is something else. I will never use the self cleaning option on my oven again! Not only did it leave dark burned looking spots running down the glass door but it turned the outer upper area of the door, which was white, yellow and also the vents on the fan. I scrubbed with everything I could think of with no results. Then I came here searching for an answer...and found one! Cerama Bryte! Made to clean glass top stoves!I rubbed it all over the glass door and the yellow on the door and fan. It took everything off the glass door and reduced the yellowing on the other parts. I will try rubbing more on them later and see if it will remove the rest of it. Thank you, thank you! Thanks. Just tried it. Worked!! Tried it. Results, none. Too far gone for a quick fix clean. I did observe that it worked on VERY lightly soiled areas. Probably amounted to one square inch of real estate on the oven door. Meaning, hubby still has to clean the oven using the chemical spray. However, once HE has to clean the messes he's made in there for over three years...I'm confident that he will be cleaning the oven in our new house monthly and promptly wiping up after it has cooled enough to do so. He will now heed my advice of using sheet pans under cakes and pies or filled to the brim casseroles that may bubble over. I'm also confident that he will no longer be "frying" bacon (at least uncovered) in the oven either. Thank you for the tip Jamie. I had been planning on cleaning the window of my oven and your advice worked well. It did get rather messy though!. In the end, with the help of a video on you tube http://youtu.be/iyw-57ExLDQ I found I could take the door off and wash it down in the yard. I am pleased to say that I can watch my cakes rising without opening the door again now! I am sorry that this did not work for you. It seems that some have had great success with this while others have not. You did mention that you used a sponge. That could be the reason it did not work. As mentioned in the post, I used a scour pad. It did take a little bit of elbow grease but it came off. Please help me!!!!! I did it not only once but 3 times and still it's not clean. I have made exactly what you wrote with baking soda I just purchased. Please tell me why it is not working for me???? Milano, I'm not sure why it would not be working for you. It seems that others have had some trouble with this recipe as well. I did have to use a scour pad on a few of the tougher areas around the edges of the glass and some spots on the door. But other than that, I do not know why this did not work for you. You made it sound easier than it was. I really had to scrub to get mine clean. There were a couple spots on mine that I had to scrub to get of but most of the stuff came off without scrubbing. I just did this to my oven door and it absolutely worked! TFS and who would have ever know that a little baking soda and water could clean up an oven door. Thanks! I tried it and left it on for several hours. Didn't work. Got some of the grime off and didn't make it sparkle like in the photo. Still have stuff in there and I even scoured with a brillo pad. Great idea. Thanks. How do you clean a line of something that went straight down between the glass on the outside and inside of the oven? It went through the tiny vents. Looks like a milky line all the way down the oven glass. Any ideas would be appreciated. No luck here. It is a little better, but sadly not nearly as good as the photo above and I scrubbed the heck out of it. How timely! I'm trying to not use the self cleaner on my oven to keep the electric bill down. I'll let you know how it goes! If your glass is really gross, try using a razor blade in one of those cheap holders to scrape the surface to break off the hard bits. Then put on the Baking Soda treatment. After it is done you can damp wipe it mostly off so you can see any more hard spots - get them with the scraper too and finish up with a damp paper towel using the left over bits of baking soda you left before. If it is a new scraper it will not scratch the glass. I use one on my glass cooktop - have for 12 years now! I never comment on blogs but HAD to comment on this one- I haven't been able to see in my oven ever- until today! Crystal clear!! (But yes- elbow grease is still required) THANK YOU!! Found this on Pinterest...gave it a try immediately...didn't work at all. Barely removed anything--just a few brown spots on the rag after I wiped it out. So disappointed. This sounds like a good idea. I have something that dripped between the windows on my oven door. There are small holes at the top so something dripped down. Any ideas how to get rid of that? Yes, Meg I can get what you are trying to say. Windows cleaning is not the same as cleaning oven glass or any other glassware. You can get these ideas on how to clean windows from the link below. D.I.Y. Window Cleaning...Hope it can be some help to you..
Did this to surprise my mom. Got all the gunk off the door, but had to scrub hard to get the rest off the glass. Defiantly took a lot of elbow grease. Thanks a bunch! I left this on for 30 minutes, scoured really hard (till I was out of breath), and it made no difference. I guess years of buildup on a 25-year-old oven can only mean one thing...time for a new oven! I tried this very same thing on my glass cook top. It said 2 lay a hot wet towel over the baking soda paste. It didn't clean a thing. After the mess was over, I sprayed the whole top w/that Clorox spray w/bleach. Holy crap did that work. SPARKLY once again. I had amazing success with a similar method..Removed the gasket, then sprinkled with baking soda. Covered that with paper towels then poured vinegar over all. Fun to watch it bubble up. Scrubbed around a bit to make sure everything was covered trying not to move the paper towels much. Let sit 15 minutes. Scrub around a bit with a teflon pad and hit any leftovers spots with a razor blade. Rinse, dry and replace the gasket. Amazing, fast and easy. I have a "self-cleaning" oven but I don't like to use that method. It works I have done this for years, I clean my entire "vintage" oven this way! 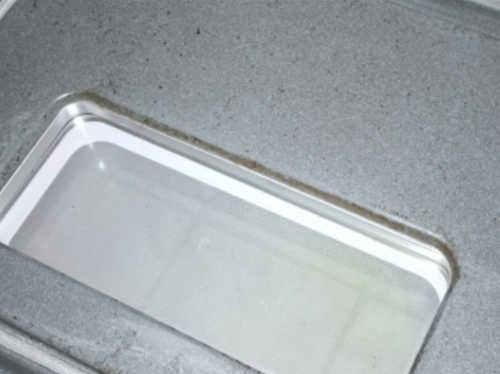 I just cleaned both my little countertop and full-size oven glass using your baking soda tip. I was amazed at how easy and effective it was. I'd tried everything I could think of, including baking soda, but nothing had worked at all. It's miraculous! Thanks so much! I agree that elbow grease was required, but not too much and it was well worth it. The second time around, this worked for me. I agree with everyone that elbow grease is required--I used a sponge with a scrubby side for mine. It was very greasy, so I sprinkled some dry baking soda over the top after putting the water/baking soda mix on. I also left it on for an hour and scrubbed. The glass looks great! The only problem I have now is that the inside (between the panes of glass) is dusty. Oh well, I'll take the door apart another day. Thanks for the tip! I just cleaned my oven glass as well as the door and the baking soda/water worked great. Not sure why all the others are not getting the same results. I left mine on about an hour and it cleaned up with very little elbow grease and it was pretty dirty. Thanks for a great tip. I will definitely use this again. Years ago someone told me that the easiest way to clean a glass fireplace screen was with a wet paper towel dipped in the fireplace ashes. My screens were filthy - but the ashes worked amazingly well. So I thought I'd try it on the oven glass, and I had the same results. A more-than-damp paper towel dipped in fireplace ashes, and go to it. Don's scrub too hard - the ashes can be abrasive if you really put your back into it. I didn't try it on the door. It also works for my tea kettle. I love finding other hints within the comments on a hint I've just discovered! I am going to try this one on our wood stove door tomorrow! This did not work for me! I scrubbed and scrubbed, and my door still looks like it needs a good cleaning. Any cleaning agent + a razor blade works wonderfully on glass too. Try it! Somewhat worked. I now have baking soda between the glass. Any tips on getting between to remove the baking soda? Didn't work for me, made a mess. I tried leaving it on the glass door for 20 minutes and then I scraped at the gunk with my my go-to non abrasive implement, and old credit card. I scraped for about 20 minutes so I don't think waiting 10 more minutes would have made a difference. It got most of burnt on greasy grime off but I suspect that I would have had better results if I had used my regular burned on grease cleaner, hot vinegar. The next time I finish using the oven I'm going to open the door, squirt on some vinegar, wait and bit and then see if the stubborn spots come off more easily. It looks like I am going to have some chalky streaks between the glass too. As for using it on the vertical surfaces. *IF* you have tried it on your door and if worked easily then I would try the following. Apply a thick paste to the walls and then cover the paste with plastic wrap. Hopefully this will slow down the gravity effect enough that the soda will get time to work. another tip for baking soda i keep box of it in my bathroom. when i take a shower put a little in my hand or on a rag. scrub the shower doors and walls with it. rinse soap scum gone. wow, I am totally amazed. I made a paste and spread with my fingers and it was getting cleaned right away as I rubbed it on with my fingers. I also used the left over on the bottom of my pans, had to sit longer, but they got cleaned. Thanks for the great tip. Didn't work on the glass at all. Left it on for 30+ minutes. It did somewhat clean the metal part of the door. Disappointed. Thank you so much! I tried this and it works! Used the vinegar instead of water and a drop of Dawn dish detergent on my sponge and applied. Rinsed using a microfiber cloth. Like you said a little bit of spot cleaning with a scouring pad finished the job. Easy peasy! Now I can see what's cookin'. Thanks again! Hey nice post, that was really informative, i liked it very much. Thanks for posting such a wonderful article. I had the same think happen ....seeped down between the glass panes on the door....looks worse now, while it DID clean. I don't know whether or not I should try to take the door apart to clean in between the window glass? Worked great for me. I didn't even wait, I am impatient, it just came off with a little elbow grease. Did this work for me? Yes...and no. Is my oven door clean & shiny...yes! I used the baking soda & water...ehh. Baking soda & vinegar...better...Scrubber, razor blade scrapper & lots of elbow grease...Viola! Was I thinking about doing this before I saw it on pinterest? Not really...Am I happy I tried it, you bet! The paper towels showed lots of grime even before I tried the heavy duty tools. So...I say it works but not without a lot of scrubbing, and no icky oven spray smell and no worries about drips ruining your kitchen floor like oven spray can. Thanks for the tip! Depends on the splatter. Magic erase sponge and vinegar but test on small corner of the glass. Sometimes mineral oil, applied to paper towel and allowed to sit, then wipe off. Ceramic stove top cleaner and razor have worked as well (also use that in the bottom of my glass cookware). My husband used wd40 and that worked but he rinsed the surface well afterwards, please note we have an electric oven and not a pilot light. Luck to all! I tried this with disastrous results! 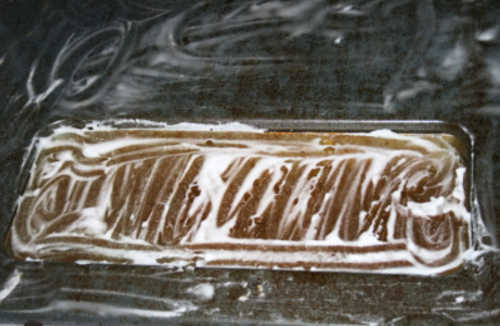 The baking soda seeped down in between the multiple layers of glass in the oven door. Long drips of white look (trust me) way worse than the brown oven grime. I had to call an appliance repair person to take the door apart. I tried doing it myself but it required special tools that I didn't have and I'm glad I didn't succeed as there were multiple layers of both glass and metal. Not worth the risk, in my opinion! I haven't tried this idea but I did put wet dryer sheets on the glass and let it sit for about 30 min. and the glass cleaned up great. You can also put your oven racks in a bath tube, cover with hot water, add 10 dryer sheets, let sit over night and all the grime just comes right off. Tried to scrub it with a brillo, and still nothing. It just made a HUGE mess, that I have to clean up now. I will be deleting this post. I found this tonight on a friend's Pinterest board, and had heard about it before but not tried it. I had mixed results; some of the topsoil came off the oven door, but not all. The glass range top came fairly clean too, but did better after I added a bit of white vinegar to my sponge to clean up the soda - that was fun. :-) It was a so-so result, but I did get a bonus. When I was rinsing the sponge out, I noticed the sink was looking pretty nice in that spot, so I just scrubbed it with the soda/vinegar sponge before rinsing it completely. Nice, sparkling sink! So, I'd give the initial experiment a B+, and throwing in that bonus brings it up to an A-. Conclusion: I'd try it again, only next time I'd add the vinegar at the first instead of as a last resort. The razor blade scraper made all the difference for me. I used vinegar and baking soda; and I'm just glad to be done with caustic oven cleaners. I can't believe someone would sell their house and leave the oven so disgusting for the new home owners. They should be ashamed of themselves. Great tip on cleaning, will give it a try! Your tips worked for me, thanks for sharing. I saw this on Pinterest a few hours ago and decided to give it a try. I applied it WITHOUT reading all of the comments first and after it had been applied for about 10 minutes, I was back online and reading the comments just to see what others said. Once I read about someone having to "replace their oven door" after doing this, I jumped up and immediately started taking off the application. Much to my surprise the stuff wiped right off and no damage was done to my oven door whatsoever! I used one of those green Brillo pads and scrubbed the oven glass...it is SPOTLESS! And now I can actually see what's inside the oven when the oven light is turned on! Bonus!! While I don't think this works without using a Brillo pad to scrub the baking soda ick off, I will definitely do it again because the glass is gleaming and there's no nasty chemical smell. Thank you for posting this!! Hello, I just used the self-clean feature on my new-ish stove for the first time today. When I saw that it had not done a thing to clean the inside of the oven window, I googled that topic and found this post. I'm so glad I did! I stirred up about half a cup of baking soda with just enough water to make a pancake-batter consistency and applied it to the glass, being careful to not get too close to the edge so that no liquid could seep down in between the panes of glass. I then set the timer for 15 minutes. I didn't want to scrub unless I absolutely had to so I could avoid scratching the glass. I used a nylon pancake turner to lift off the bulk of the baking soda paste, then I wet a soft terry cloth rag, wrang it out well and wiped from the outside edge toward the center. This low-water method required several passes to clear off the baking soda film. I was amazed to see how well it had cleaned my greasy window! Thank you so much for this fabulous tip! I'm a food writer and blogger, so my oven gets quite a workout! AMAZING! I'm doing it tomorrow! Doesn't work. Useless. ANd it makes a mess if it gets between the glass and the door. While this technique (with the addition of covering the paste with a damp towel) works for my ceramic cook top, it didn't touch the grime on the door. Even after an hour. Just tried it and it worked great!! Made the paste pretty thick so it did not run at all. I use a single-sided razor blade to remove the deposits on the glass oven glass door. I also do the same thing on our wood-stove's glass doors, too. I'm with Mama B -- I just tried this technique TWICE, including covered the paste with a hot towel and it did nothing for the glass or the inside of the door. I guess I'll have to buy some Easy Off tomorrow. Argh. Update: After the baking soda paste fail, I tested Cerama-Bryte cooktop cleaner, Vim cream, and Mr Clean Magic Eraser (all of which I had already). The Cerama-Bryte was by far the best -- in fact, it was the only one that made any difference. I applied it, wiped it around all over the glass, let it sit for about 15 minutes, then used a scrubbing pad to scour it. After putting in some effort, I wiped the cream off and then scraped the glass with a razor blade (very carefully). I then did the cream again and it is now perfectly clean. Save your effort, skip the baking soda, and go for ceramic cooktop cleaner and a razor. I just tried this -BEFORE- reading all of the comments. I was freaking out that I had ruined my door/glass, while I let it sit! It didn't ruin anything, but it didn't really work all that great either. I didn't have an sos/scouring pad, only a sponge with a scrubby side, so maybe that was the problem? Bummer, didn't work even after 30 minutes and scrubbing. Thanks for this tip. I have had my oven since new for 6 years now and tried this method. It worked quite well. While it didn't all come off (I'm thinking b/c it has been 6 years) I will do another pass when I have more time and I'm sure it will sparkle. The bulk of the mess did come off and I love that it is fume free and something we all have at home. I am in love with baking soda. It worked on my oven doors and my daughter took apart the doors and we cleaned the glass on both sides. It looks like a new door. I have since cleaned my cookie sheets. Happy hubby and me! I use a razor blade on the windows it might ruin the porcelain glaze on your door but I use it on the rest of the door as while. Did not work for me!!! Waste of time. Oven cleaner is the only way to cut through the grease for me. Thanks anyway. Just completed cleaning my oven door and it worked beautifully! Thank you so very much for the tip. I am eliminating chemicals from my household and this is an excellent source I will keep handy from now on, thank you! Happy New Year! Rinse with white vinegar and there's no need to scrub. i think im going to try this out now as well ..... i wounder if it would work on the rest of the oven ..? hmm ill find out :D thanks ! This got all the grime off my basically black oven window! I used double the amount (1/2 cup baking soda, enough water to make a paste), and left it on for 30 minutes. Then just added a lotta elbow grease! Will definitely use this method again. I have always done this with Windex and a razor scraper. Never came out looking this great! I'll try your tip now. I like your posts very much. I find I usually copy and paste the pertinent information into a separate email, deleting extraneous info. It would be very helpful if there was a 'print' feature whereby just the recipe would print. Your information is very helpful and beneficial and I do share it with as many people as I can. Regards. I had already used Clorox with bleach first and removed some of the grime on the glass but I gave this a try on the second attempt. Using a scotchbrite pad I was able to remove the rest of the spots using the baking powder paste. Thanks for the tip.